Consider: has any current non-Tide coach in the league outperformed his program’s historical baseline more than Mullen? Has any SEC coach accomplished more with less 247Sports Composite Rankings-approved talent? And that, friends, is why arguing for Dan Mullen — Dan Mullen! — as the second-best football coach in the Southbleepingeastern Conference makes a substantial amount of sense. You’ve got Gus Malzahn taking our own beloved Auburn Tigers to the 2013 SEC championship and BCS title game, but what other accomplishment among the league’s current coaching crop is worthy of finishing that previous paragraph? Jim McElwain dragging the Gators to the East title these past two seasons? Kevin Sumlin’s rocket-fueled 2012 ride with Johnny Football? Hugh Freeze’s back-to-back New Year’s Six appearances? Given the state of the East and the Tide’s merciless slaughters in Atlanta, it’s hard to give McElwain too much credit for his division titles (even Gator fans don’t seem especially inclined to, do they?) and it feels like both Sumlin and Freeze have already watched their personal peaks come and go. The cupboard for active SEC coaching success is bare enough some folks — well-informed ones! — are even willing to stump for Bert. As for Gus, if his 2013 run isn’t enough for you to slot him in as the SEC’s No. 2 after 16 losses in three seasons, I’m not gonna argue. That’s the second-craziest thing about this tweet: my initial reaction, hand over my heart, was Win or lose to Bama, if Mullen’s really the second-best coach in the SEC, there’s zero reason Auburn can’t finish this season as the second-best team in the league and go to the New Year’s Six. Then it hit me: They already did that last year! 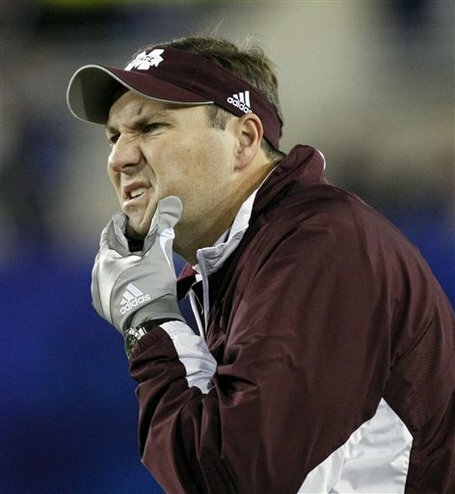 Both Auburn fans’ collective irritation at a season that ended in New Orleans — mine 100 percent included — and the inability to definitively claim someone other than Dan Mullen as the SEC’s second-best coach speaks to what a truly weird place the league finds itself in this summer. Outside of the fanbases at Alabama, LSU, Vandy or Kentucky, is anyone truly excited about their head coaches? We can acknowledge the vibes at Mississippi State and South Carolina are also more positive than negative after Mullen’s Egg Bowl win and Muschamp’s surprisingly successful debut season. But that still leaves eight teams in varying states of discontent: Auburn and Texas A&M fans are stinging from their supposed offensive sorcerer coaches struggling to produce any actual sparks from their fingertips; Ole Miss fans have the twin black clouds of a 5-7 finish and NCAA involvement to deal with; Arkansas fans have watched the Hogs blow an endless succession of leads on their way to a mid-tier bowl game for what feels like a decade running; Florida fans feel like they’ve just watched the two most boring teams to ever make the SEC title game, because they did; Tennessee fans watched Butch Jones’ first four years steadily build all the way to the high of a Music City Bowl berth, with the roster now frighteningly depleted; Georgia* and Missouri fans have to simultaneously express patience with their new hires along with the natural concern that coaches whose debuts included a terrifying scrape past Nicholls State/a loss to Middle Tennessee may not be the right long-term choices. (If they’re statistically inclined, they may also be unhappy their teams finished nestled directly alongside each other at 68th and 69th in S&P+). It’s worth noting, too, that four of the SEC’s “Big Six” fall in the uneasy-feeling category, that one of the Big Six members that doesn’t is still on its Ed Orgeron honeymoon, and that the program arguably closest to those six in prestige/recruiting/support/cash — Texas A&M — is home to perhaps the hottest coaching seat in the league. In short: I can’t remember a time I felt like the SEC had less faith in its collective coaching acumen. The explanation for this state-of-dissatisfied-affairs is a two-parter. Part the first is simple enough: when the league’s previous 17 titles have been awarded to just seven coaches, and three of those coaches get shown the door in the span of two seasons (after losing just two the previous 15), there’s going to be a vacuum. Part the second: that vacuum hasn’t been filled the way you’d expect the SEC to fill it. Jim McElwain built a decent resume at Alabama and then Colorado State, but had he built a Florida resume? Though to be fair, Jimbo Fisher’s ascendance means the mantle of “best job in the East” may have passed to Athens, which the Dawgs capitalized on by hiring … a coach with an even thinner resume than McElwain. LSU hired an interim coach with a lifetime 7-23 SEC record. Like McElwain, Butch Jones enjoyed enough success at his two previous stops to make him an acceptable candidate, but not enough success you’d expect him to actually land a job as well-paid as Tennessee’s — particularly on the immediate heels of the Bielema hire at Arkansas. The narrative in many corners following Bert’s defection from Wisconsin was that the SEC’s bottomless coffers and unrivaled respect among media and recruits would make it the only coaching destination that mattered, and really, why would you argue otherwise when the West’s fifth-best job (at best) was still enough to lure away the most accomplished coach in the nation’s second-richest conference? But Bert wasn’t the start of a trend; he was the end of one. It’s now been four-plus years, and even with Florida, Georgia and LSU having come open (not to mention the equally-attractive South Carolina job) the SEC hasn’t seen a hire half as proven as Bielema since**. That’s not to say resume is everything, of course. The reigning national champion is helmed by a dude it promoted from special teams coach. There’s reason to think McElwain’s doing a better job than it might appear. Orgeron answered his staffing questions by nailing his offensive coordinator hire and retaining his terrific defensive coordinator. Smart’s first full recruiting class ranked third in the country. The potential for all three is obviously there, while Bert’s struggled to do anything meaningful since pulling the Hogs out of their John L. Smith-induced sinkhole. The final verdict on this post-2012 generation of SEC hires remains years away — and the verdict for the Sumlin/Bert/Jones/Malzahn generation hasn’t reached a final rendering, either. But we can say this much: there’s no Urban Meyer among these coaches, either, no coach that could have gone anywhere and went to the SEC. Tom Herman chose Texas. Michigan pulled Jim Harbaugh home. Mike Gundy, Mark Dantonio, David Shaw, rumored current-and-former NFL coaches of all notable stripes .. all still where they started. That’s not to say the SEC’s recent candidacies could have been filled by any of the above names — Lord knows I think LSU did what it could to land Herman — but simply that they haven’t. The result: honest argument that Dan Mullen is the second-best coach in the SEC. And speaking as an Auburn fan, the other result: my honest belief that Gus Malzahn has a gilt-edged opportunity to make “second-best team in the SEC, New Year’s Six-bound” more than a one-off. Until/unless the post-2012 hires prove otherwise, the best-outside-of-Tuscaloosa vacuum is there. No one filled it in 2016, but Auburn came closer than anyone — and with Jarrett Stidham in place, the defense recovered from its 2014 pratfall, Chip Lindsey on hand to save Gus from his worst Coxcat self, yes, I believe Auburn is as close as anyone to filling it on a longer-term basis. Hell, maybe they’re closer than I think to doing even more than that. But that’s November talk. May talk: save for the obvious, there’s nothing to be afraid of in the 2017 SEC. The door with Auburn on one side and 10 wins and a second straight NY6 appearance on the other couldn’t be more open. Guide Auburn through it, Gus***, and maybe they won’t even bother mentioning your Starkville colleague at this time next year. *It’s possible I’m projecting my own skepticism regarding Smart onto Dawg fans, who may be more optimistic than I’m giving them credit for and have the backing of a surprisingly bullish preseason media to boot. But Jacob Eason (or a true freshman) throwing behind an overhauled offensive line to an anonymous receiving corps as orchestrated by Jim Chaney doesn’t strike me as the recipe for a major step forward. We’ll see. **Strange but true: the SEC’s basketball hires are currently outstripping its football hires. When Bruce Pearl is at Auburn, Ben Howland’s at Mississippi State, Bryce Drew’s at Vandy, Avery Johnson’s at Alabama, Rick Barnes is at Tennessee — all the rough equivalent of Bert going to Arkansas, or even Bert going to, say, Kentucky — I’m not sure it’s even all that debatable. ***Preferably without the migraine-inducing loss to Georgia this time, thanks. …..Something I stumbled onto yesterday, was that Mississippi State and Florida have the exact same 56-35 record over the past 7 years. I think the MSU folks are pretty pleased with him, while Florida is on their 3rd head coach during the same period. ……Behind Alabama over the past decade, number 2 is LSU, followed by Georgia 3rd. Both schools fired their head coach responsible for that success. The unstated premise here is that top-tier coaches may be steering clear of the SEC until Saban retires. If you’re looking at a job in the SEC West, you’ve got to play Alabama, and probably lose to them, every year, while battling for a second-place finish at best. And if you’re in the East, you’ve got an easier path to Atlanta, only to end up as roadkill in the championship game. And all the while you’re dealing with a passionate fan base that demands, at the very least, that you stay competitive with the most dominant college football program of the modern era. So, if you’re somebody like Tom Herman, with a choice between LSU or Texas, the decision seems like a no-brainer. What will really be interesting to watch is what happens when Saban does retire and Alabama takes the inevitable step backward. Then, we might see an unprecedented influx of coaching talent into the league, because there are several schools – and Auburn is one of them – with the pieces in place to contend for championships on an annual basis. Had not seen that UF/MSU comparison, Acid. Interesting. DB, it’s possible Saban is singlehandedly driving away the Hermans of the world, but I’m skeptical. UGA didn’t even make a run at him. SC could’ve gone after Fuente instead of Muschamp. Don’t remember UF’s other options off-hand, but they seemed to settle on McElwain pretty quickly. Maybe Herman took Saban’s presence into account before spurning LSU, yes, but by and large this looks to me like schools making iffy decisions more than coaches running away from Saban. But I think we’ll see a couple more major jobs turn over this offseason, and if the top coaching prospects go elsewhere, then you may be on to something. …..I think Coach O is a great hire, IF they stick with him for a few years. LSU isn’t going to be terribly great on offense, this year, unless they just line up Les Miles-style and try to run over every team they play. This will work on the MSU’s of the league. It won’t work against Bama and Florida, and probably not Auburn. Another typical 9-3/8-4 season will follow. If Orgeron lets his offense develop, the record may actually be worse, but the future will be brighter. Will be interesting to see how short Coach O’s leash is.